Five other candidates received less than one-half of 1 percentage point support: former Virginia Gov. Jim Gilmore, Sen. Lindsey Graham of South Carolina, Louisiana Gov. Bobby Jindal, former New York Gov. George Pataki and Wisconsin Gov. 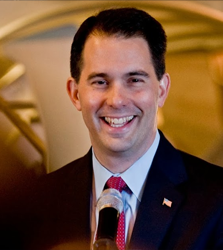 Scott Walker…. Celebrated by conservatives -- in the party's base and its donor class alike -- for his union-busting efforts in Wisconsin, Walker at one point led the field in the key early voting state of Iowa. His support had already dropped to 5% in a CNN/ORC poll in early September, but the bottom appears to have fallen out completely since then -- with a second flat debate performance coming after criticism of his disparate answers on issues like birthright citizenship. After leading the polls in Iowa for much of the year, Walker has fallen to 7th place there in the RealClearPolitics average. That's his best poll result — he's now in 9th place nationally and in 10th in New Hampshire…. The Associated Press's Scott Bauer and Julie Bykowicz reported Thursday that "nervous campaign vendors are currently waiting to be paid more than $100,000 for outstanding debts" by Walker's campaign. The last of those points above is particularly ominous. Word of money problems often serves as the canary in the coal mine — signifying an imminent campaign collapse. And they can start a downward spiral, leading supporters to jump ship and fundraising to dry up because the candidate looks more and more like a loser…. The next debate is a long way away, and there's no indication that Donald Trump is going to stop monopolizing media attention anytime soon. Meanwhile, the host of that debate, CNBC, hasn't announced how it will determine who qualifies — but if it uses national polls, like Fox News and CNN did, Walker could be in serious danger of failing to make the cut. Not being in the next debate, scheduled for Oct. 28 in Colorado, could prove a fatal blow to Walker’s presidential hopes. The article also mentions that Walker’s campaign has 90 full-time staffers, and suggests Walker could downsize his campaign considerably in order to conserve funds in a way similar to what eventual 2008 nominee John McCain did. In a span of two months, the Wisconsin governor has gone from leading the Iowa race with 18 percent support in a Quinnipiac University survey released July 1, to just 3 percent support in the polling organization's Sept. 11 tally. Whether there's another climb up the tracks isn’t likely to be known for weeks or months, as Walker deploys a new strategy that places virtually all his chips on Iowa…. In an interview, Walker said he's planning to spend 10 days a month in Iowa, "maybe more." Other than "fundraising and visits to New Hampshire and South Carolina," his time will be spent in Iowa, he said. Walker's focus on Iowa, even if successful, could put at risk his viability, should the nomination process drag into the spring or early summer of 2016, as Republican leaders and strategists increasingly expect. If he doesn't raise enough money to look and play like a national candidate, he might not have the resources to compete past Iowa. Walker still possesses all the attributes that originally made him a frontrunner, including a record consistent with what the Republican base wants in a candidate as well as an ability to appeal across different elements of the party. And the emergence of Trump has certainly scrambled the field, making it even more difficult than usual to see how the process will unfold. But Walker’s fall from frontrunner to failing to register in a national poll suggests that whatever path may exist for him to get back in the race, it will be an arduous one.